Today we continue with the second part of our series of 750W power supplies. 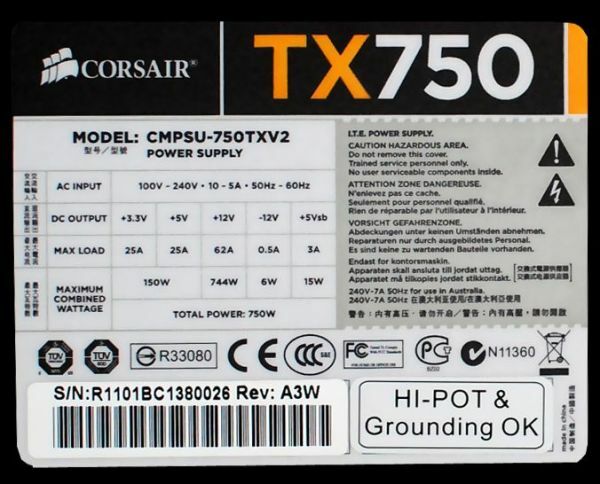 The Corsair TX V2 is the second 80 Plus Bronze certified PSU with non-modular cables that we're looking at for this range. Corsair might be a leading manufacturer of RAM modules and SSDs, but power supply quality depends largely on the ODM and their design. The big question of the PSU source is easy to answer. Seasonic is the company behind many Corsair products—and they're definitely a good choice, much better than using CWT like the original TX750—but what about the internal design and components? Corsair's TX V2 750W includes a power cord for the American power grid, four screws, one Corsair sticker (for your case), and a manual. The latter is more like a warranty agreement than a helping hand. There is an installation guide, but the warranty part shows some interesting limitations. "[Corsair] shall not be liable for any special, incidental, indirect or consequential damages [...] including [...] loss of profits, revenue, or data." So the 5-year warranty won't help you, other than getting a new PSU should the TX750 go belly up. Don't worry, though; these are common terms and are present with nearly every PSU. While if it is not stated directly anywhere, the sticker indicates Corsair is using a single rail for +12V. We'll see later that this is not the case, so we'd like to see Corsair list both 12V rails on their sticker to avoid confusion. 744W combined power also indicates this is another PSU with DC-to-DC VRM. +3.3V and +5V are rated at 25A each and should be able to provide enough power for HDDs/SSDs and/or other peripheral components. 3A on +5VSB is also relatively strong. Corsair uses a 140mm fan from Yate Loon with a ball bearing. The product number is D14BH-12 and it takes 0.70A. A Sanyo Denki fan would be better but the price could be a problem and Sanyo Denki is still a reason to buy the more expensive Corsair AX. Corsair differentiates between the two lines by modifications such as this, which helps them reach lower cost markets. It's "new" as it just came out and "improved" since this is marked as version 2. I quickly read the article, but I didn't see any mention of how well the TX750 V2 does compared to the its predecessor, the TX750? What are the pros/cons of going with the V2 compared to the original?